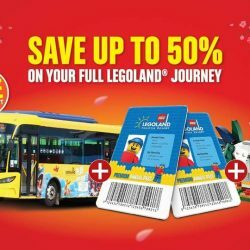 Save up to 50% on your full journey to LEGOLAND Malaysia this Lunar New Year with their limited Annual Pass flash deal! Buy 1 Premium Annual Pass and get the 2nd one at half price, and enjoy FREE round trip from Singapore to LEGOLAND Malaysia! Not only that, bring home the limited edition LEGO® Rooster while stock lasts! Hurry & get yours now! Bring your kids to Legoland Malaysia Resort for a fun-filled time at its theme park and water park! Enjoy their NEW Lego Adventure in 4D, an all-new, totally original 4D movie only at Legoland in 2016. 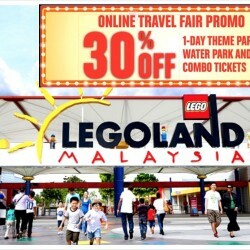 They are having on online travel fair promo with 30% OFF 1-Day Theme Park, Water Park and Combo tickets. Book online and save now!